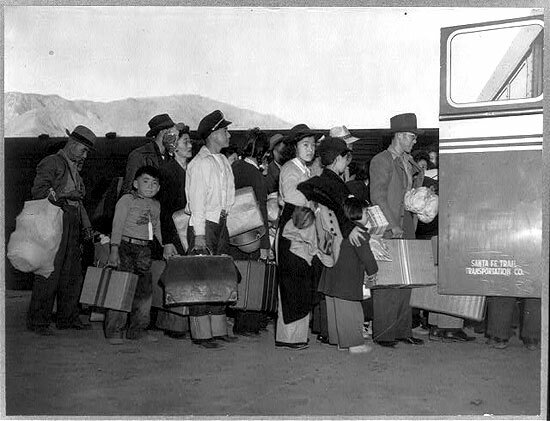 To better understand the arguments against this proposal, we have provided a historical overview of Japanese American internment and the National Security Entry-Exit Registration System (“NSEERS”) that members of Trump’s team hope to reinstate. In the landmark case Korematsu v. United States, the Supreme Court upheld the constitutionality of Civilian Exclusion Order No. 34, which called for the detainment of American citizens of Japanese ancestry during WWII. Order No. 34 was promulgated under authority of Executive Order No. 9066 and the Act of March 21, 1942 as a protectionist means against espionage and sabotage while at war with Japan. 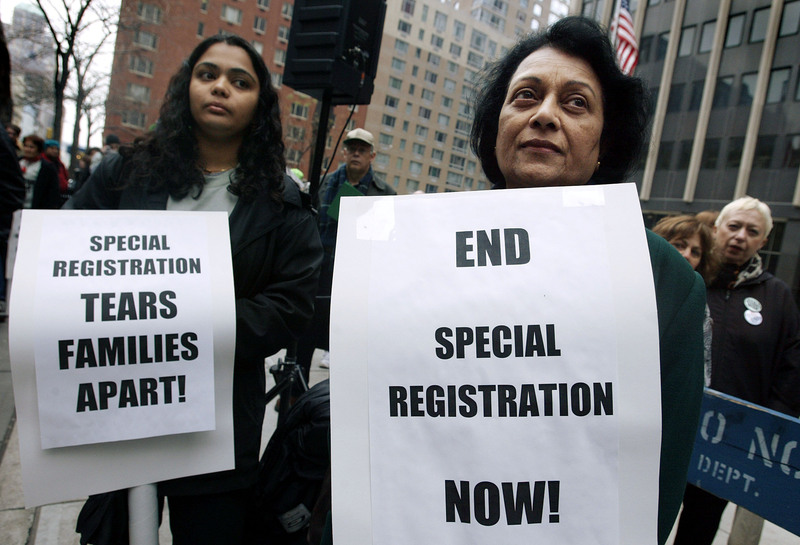 In 1983, Judge Marilyn Hall Patel of the Northern District of California reversed Korematsu’s conviction forty years after the fact, and recognized the “manifest injustice” to those interned. 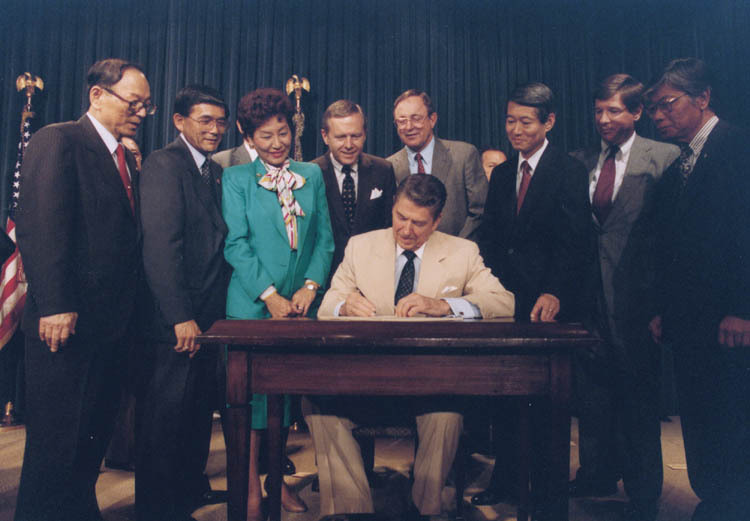 In 1988, led by the Japanese American Citizens League (“JACL”) and Rep. Norm Mineta of California, Congress approved the Civil Liberties Act of 1988. This bill formally pardoned Korematsu and other Japanese Americans convicted of violating laws or executive orders during internment. Through the Act, President Reagan and Congress also apologized and made appropriations of $20,000 (approx. $40,000 in 2016) to more than 100,000 Japanese Americans who were forced to relocate from their homes to live in concentration camps during WWII. In 2010, Congress unanimously passed a bill recognizing the Japanese American servicemen and women of the 442nd Regimental Combat Team, the 100th Infantry Division, and the Military Intelligence Service with the Congressional Gold Medal. This bill, Public Law 111-254, recognized that these veterans, including decorated war hero Sen. Daniel Inouye of Hawaii, also fought a battle of “discrimination at home” in the United States. 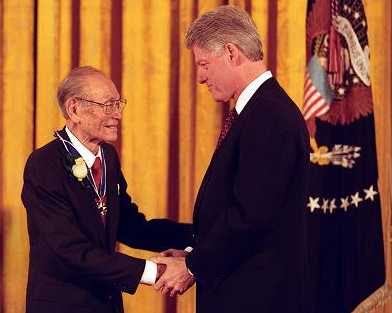 Fred Korematsu receives the Presidential Medal of Freedom from President Bill Clinton on January 15, 1998. Shortly after September 11, 2001, the Department of Justice put into place the National Security Entry-Exit Registration System (“NSEERS”), which affected males 16 years or older from 25 countries, 24 of which have majority Muslim populations. The program had three parts: (1) registration, fingerprinting, and interrogation of males from these countries at an American port-of-entry; (2) domestic registration of non-citizens already in the United States under a temporary visa at a local immigration office; and (3) exit registration at the time of departure. Eight years later, DHS found NSEERS to be “redundant” with existing port-of-entry technology that collects data from visitors and immigrants worldwide, and found that the program “did not provide any increase in security.” DHS then removed all 25 countries from the NSEERS compliance list. Mario Tama/Getty Images – Two women protest domestic registration under NSEERS that targeted citizens of majority-Muslim countries in late 2003. As examined above, while Korematsu considers the rights of American citizens, NSEERS and its future iterations primarily consider the documentation and immigration process of non-citizens. This is an important distinction, as any president has broad powers to control immigration policy. While GOP Chairman and incoming White House Chief of Staff Reince Priebus said he was “not going to rule out anything” regarding a registry, he also stated that the administration would not “have a registry based on religion.” Potential Secretary of Homeland Security (and principal architect of NSEERS) Kris Kobach defended NSEERS as impacting non-Americans from predominantly Muslim nations but without regard to religion. However, documents from a meeting with President-elect Trump contradict his claim, revealing that Kobach wants NSEERS to include vetting questions about Sharia law and jihad. And there is no doubt about the disproportionate effect a future iteration of NSEERS will have on Muslims worldwide. Mike Segar/Reuters – President-elect Trump meets with Kansas Secretary of State and NSEERS architect Kris Kobach on November 21, 2016. At the top of Kobach’s agenda is a proposal to reinstate NSEERS. We cannot deny the importance of national security and the current failures of immigration regulation and policy. However, Trump’s team need not explore the revitalization of NSEERS as it has already been deemed obsolete, redundant, and discriminatory. Korematsu is a poor precedent for any such registry. Rather, it provides a precedent for the blatant wrongs of discrimination by national origin and denial of human rights. In an America that is divided by the current state of politics, we must each do our part to understand history, its injustices, and their application to modern dilemmas. We must persevere to create and uphold policy that is calculated and fair, and not simply an easy response to quell hysteria and fear. We must move forward with careful and deliberate action with the intent of improving our civil society and upholding our values as a democratic nation. Kei M. Ashizawa is an attorney from Houston, Texas who is currently earning her Master in Public Administration from Harvard University’s Kennedy School of Government. She is a hapa nisei Japanese American who is active in U.S.-Japan relations. Ginger Koto Vaughn is a Japanese-American media consultant living in Japan. She is faculty at Akita International University where she focuses on global communication and public relations. She holds an MBA from Waseda University and MA in Communications from the University of Houston. 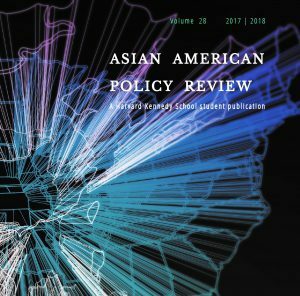 Andy Vo is the Online Managing Editor of the Asian American Policy Review, and a second-year Master in Public Policy student at the Harvard Kennedy School. He is also the co-chair of the LGBTQ Caucus and a founding member of the Live Poets Society, a spoken word group at HKS.